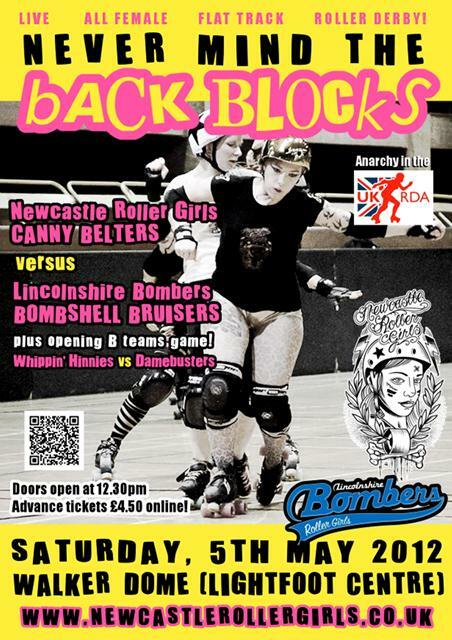 NRGs all star team the Canny Belters will be taking on the mighty Lincolnshire Bombers Bombshell Bruisers, one of the most well established teams in the UK in a clash that’s set to rock the casbah. The two have never met on track so it’s going to be a doozy! Two teams who have most definitely met before are the NRG B team The Whippin Hinnies and LBR’s B team the Damebusters. The Hinnies managed to take the win in the last match up, can they repeat the feat on home turf? So shine up the 14 hole cherry red docs, connect up the straps on your best tartan trousers and pogo on down to see the action. Then get yourselves along to our after party venue – The Ware Rooms, should you be making a weekend of it, get in touch with us and we can hook you up with some great room deals from our sponsors The Euro Hostel. 4.00pm – Hand slapping time! Don’t miss out and get your ticket online now!